Slice radishes 1/8” thick; keep crisp by soaking in water until ready to use. In a saucepan, submerge eggs with water, turn heat to high and bring to boil. Reduce heat to medium low and cook for 15 min more. Remove egg pan from heat and run under cold water for 3 min. Crack egg shells and carefully peel off shell. Rinse egg making sure to remove any shell. Gently dry with paper towel. In a medium bowl, mash eggs with potato masher or fork until crumbly. Add mayonnaise, salt and pepper. Mix together until smooth. Dry radish slices and place on serving dish. Pipe or scoop filling evenly on top. Sprinkle with paprika and garnish dill sprig. 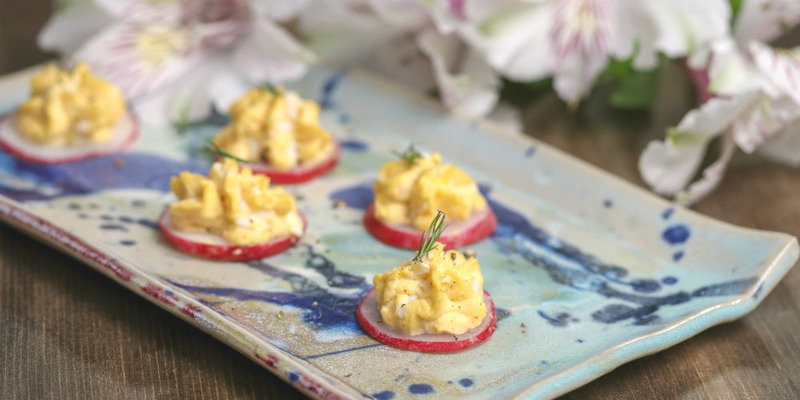 For best results, pipe egg onto radish slices no more than 4 hours before serving.